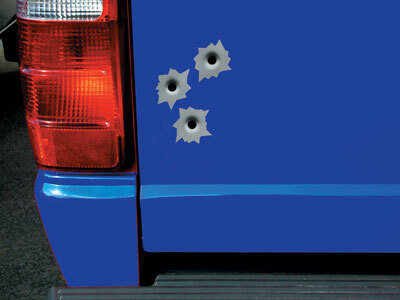 Magnetic Bullet Holes for That "Drive By Look"
Very Realistic- Reuseable-Does Not Harm Surface! These very realistic looking magnetic bullet holes are sure to cause a stir. They can instantly adhere to any clean steel surface; no adhesive is needed. The authentic gray coloring looks like a vehicle's paint has been blasted down to the primer. Made of flexible rubber ferrite, these re-useable bullet holes can be applied or removed instantly. They are weatherproof and remain securely in place even on a vehicle at high speeds. They are effective on any color paint and will not harm the surface. Position with darker shading on upper portion. Create your own "shooting scene" for a deserving car or motorcycle owner to come upon. Sold in sets of 6 bullet holes. -Looks real on any color car. -The latest trick. Put 'em on-Take 'em off. -No sticky glues or adhesives.Adheres to any steel surface. -Put them on your friends car. -0.15-mil thick flexible rubber magnet won?t harm your paint job.